Spooktober: Over $12,000 In Fantastic Treats At Platinum Play! Platinum Play offers players a host of fantastic casino promotions to indulge in this October in the spooky Spooktober campaign with more than $12,000 in fantastic treats! - In the final week, play in an accumulator tournament for a spine-tingling jackpot that starts at $3,000… and grows! Watch out for the Black Cat! One mystery day every week is Black Cat Bonus day, where you can win extra prizes! Cats are elusive creatures, and you never know when they’ll come and visit. Keep popping into the casino so you don’t miss the Black Cat Bonus Days! Furthermore, the Microgaming progressive jackpot network currently stands at over €5,1 million! Why not give some of these progressive jackpot games a go. You could become instant millionaire! Mega Moolah has the highest individual jackpot, currently at over €3,5 million and is available across all Platinum Play platforms – Mobile, Desktop, and Browser. Step into the macabre world of spooks, witches and demons, and you could win fantastic treats. 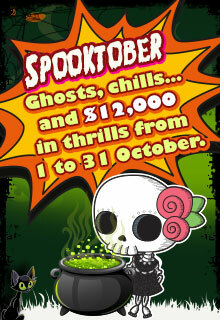 It’s easy to get your Spooktober thrills – simply download the casino software, register and play! $14,500 Slotoberfest At Omni Casino!